Pius II, Pont. Max: Epistolae familiares. Louvain: Johannes de Westfalia, 1483. Fol. a-y8 aa-qq8. leaves, the first blank. ISTC ip00718000; Goff P718; BMC IX 141; Bod-inc P-319. Includes tracts and bulls of Pius II, and Poggius Florentinus: Epistola de balneis. 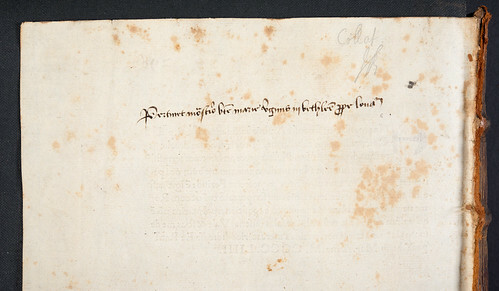 Provenance: Bethlehem (Herent), near Louvain, Augustinian Canons, BVM: inscription on a2r “bethleem”, and on qq8v “Pertinet mo[na]ſt[er]io b[ea]te marie v[ir]ginis in bethlee[m] p[ro]pe loua[niu]m”. John Bridges (1666-1724), topographer, FRS: inscriptions on a1v “Noell”, “1720 Londini 15 m”, “J. Bridges”; annotation in pencil on qq8v “Collat JB”; lot 635 “Aeneae Silvii Epist. Familiar. Cor. Russ. Lovan. 1483” in 'Bibliothecae Bridgesianae catalogus: or, a catalogue of the entire library of John Bridges ...' London: 1725 (http://archive.org/stream/bibliothecaebrid00cock#page/n9/mode/2up). John Baber (d. 1765): lot 171 “Aenei Sylvii Epistolae, corio russico Lovan. 1583 [i.e. 1483]” in 'A catalogue of the genuine and elegant library of John Baber ... of Sunning-Hill Park, lately deceased ... which will begin to be sold by auction, by Samuel Baker ... on Monday, the 31st of March, 1766 ...' (London: ). William Hunter (1718-1783), physician and anatomist: purchased at the Baber sale for £0.13.0 according to the annotated BL copy of the Baber sale catalogue - shelfmark S.C.S. 6*(2). University of Glasgow: Hunterian bequest 1807; Hunterian Museum bookplate on front pastedown, with former shelfmark “O.3.3”. Binding: 18th-century, gold-tooled diced calf; covers decorated to a two panel design; the inner panel, which is formed from fillets and a fleur-de-lys roll, has at its outer corners a lozenge-shaped floral ornament; the frame of the outer panel is formed from a double fillet; gold-tooled spine; sprinkled red-edged leaves. Size: 296 x 222 mm. Leaf size: 282 x 210 mm. Annotations: Occasional brief marginal annotations in a 16th-century hand in gatherings a-c; 16th-century manuscript foliation “1”-“101” in red ink beginning at a2r, continuing in brown ink (with errors and gaps) “102”-“298”; references in an 18th-century hand on front free endpaper to the Index expurgatorius, Journal des sçavans, République des lettres. Decoration: Four-line initial “E” on a2r sketched in pen-and-ink and the same hand has supplied an outline sketch of a foliate inner and lower border; other initials throughout supplied in alternate red and blue; capital strokes, paragraph marks, underlining of epistle and other headings supplied in red throughout.